Ich Bin Ein Celebrity Juden, Get Me Out Of Here! 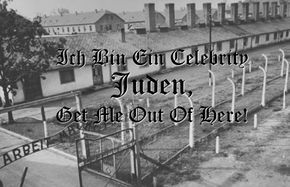 was an early Reality TV series, broadcast in either Germany or Poland from 1942 to 1945, in which a group of Jewish celebrities of the era were brought together in a camp, and filmed performing a series of tasks. They were all competing to win the popular public vote, which would allow them to leave the camp after a refreshing shower. The show's motto was "Ratings Macht Frei". The show was presented by popular minister of propaganda, Joseph Goebbels, famous for his catchphrase "it's zer vay I tell zem ... vot to believe! ", and consisted of 200 famous Jewish contestants living together in a 20-man dormitory block, with their every move being recorded, and selected highlights being broadcast for public enjoyment in nightly episodes. The highlights were amusingly linked by Herr Goebbels, and every night a contestant would be selected to perform a task, the successful completion of which would allow the "roommates" certain luxuries, such as a bed free from lice (just one bed between all of them, of course - no sense giving the Jews too many luxuries), clothing, and even some stale bread and water - all very generous and desirable prizes. At the end of each week, the surviving contestants were put up for popular public vote, the winner being allowed to repair to the shower block, where their every move was filmed as they prepared for freedom. This was by far the most popular part of the show, attracting record audiences. The prospect of freedom to live in a new Jewish state being created in Nazi Germany - a promise personally guaranteed by the Führer - was a great incentive, and the list of Jewish celebrities applying to participate was huge. Prospective "roommates" were asked to identify themselves by wearing a star at all times, in order to mark them out from regular Jews. Of course, some were reluctant to appear on the show, calling it "exploitative", "vulgar" and "a crude mask for the real motives of killing millions of innocent people in a barbaric and totalitarian regime". Such people went to extreme lengths to avoid appearing on the show, some even going into hiding - but ironically, this only increased their popularity, until public demand for their appearance was enormous. In order to give the public what they want, Goebbels ensured they were tracked down, and "persuaded" at gunpoint to participate. Nazi Germany was all about listening to the masses! The X-Ray Game: contestants had to try and withstand exposure to a dose of X-Rays great enough to kill a herd of Buffalo! Gangrene Survival: camp physician Dr Mengele injected contestants with a possibly lethal dose of gangrene - if they survived, they could return to camp with their head held high, and their extremities in a bucket! The Arms Race: contestants had to try and assemble enough weaponry from the parts provided to equip a full firing squad - against the clock! Those who failed had their arms shot off by those members of the firing squad they had managed to equip! The series ran for 4 years, was hailed by Goebbels as a resounding success, and attracted record ratings for the era - far outstripping such popular shows as Holocaust Tycoon - The TV Show, The Weakest Jewish Link, and Uncle Führer's Cuddly Children's Story Corner. However, a recent survey of all German citizens alive at the time of the war found that none of them had ever watched it, and furthermore, none of them even remember it. 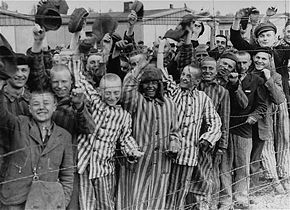 "I certainly never watched anything of zer sort", said typical respondent Hans Freekit, "und zer final 1944 episode where zer winner vos allowed to select 50 friends from zer camp to join him in zer showers vos certainly not mein favourite." Prominent Iranian historian Mahmoud Ahmadinejad has even gone as far as to claim that the show was never even made.